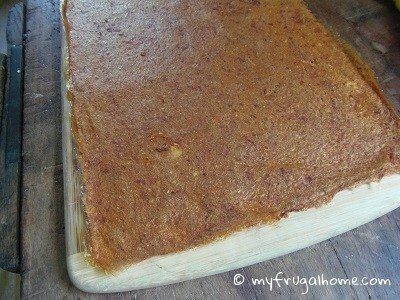 Last week I showed you how to make fruit leather in a dehydrator. Today let’s look at how to make it in the oven. Chop your fruit, if using fresh. Drain your fruit, if using canned. Then, give your fruit a quick whirl in the blender to puree it. You’ll need about three cups of puree to make a single batch of fruit leather. If you come up short, add more fruit, or stretch what you have by adding applesauce. Line a cookie sheet with microwave-safe plastic wrap, be careful not to wrap the plastic too far down the sides of the pan. You don’t want it to come into contact with the oven rack when you pop it in the oven later. 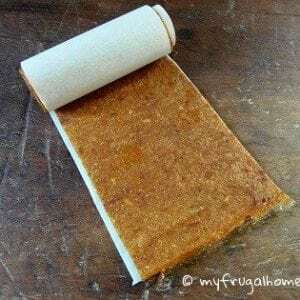 Note: If you own a silicone baking mat, you can use this instead. Then, spread your puree out on the cookie sheet, and smooth it out to an even 1/8-inch thick layer. Stick the tray in the oven, and set it to its lowest temperature. On my oven that’s 200 degrees, but newer ovens usually have a warming setting that’s even lower. Since you want to dry the puree out – not cook it (or melt the plastic wrap) – the lowest option really is best. Let it dry for 8-12 hours, or until the fruit feels dry to the touch. Then, peel the fruit leather off of the plastic wrap, and cut it into individual servings. A pair of scissors or a pizza cutter makes quick work of this. Finish by rolling your fruit leather up in a bit of parchment paper, and you have the perfect snack or lunchbox treat! 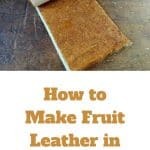 Make your own fruit leather in the oven, using fresh or canned fruit. Here are step-by-step instructions. 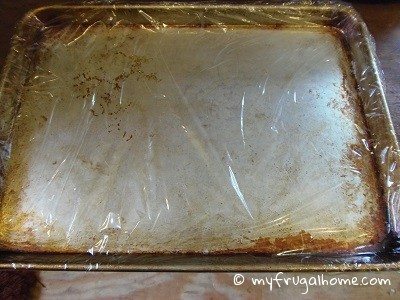 Line a cookie sheet with microwave-safe plastic wrap. Make sure the plastic wrap doesn’t extend too far down the sides of the pan; you don’t want it to touch the oven rack. If you own a silicone baking mat, you can use it instead. 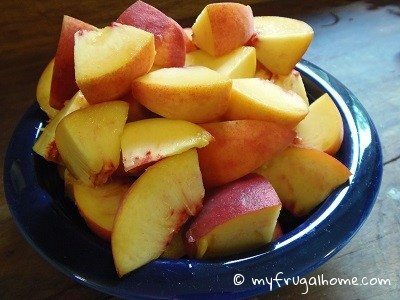 Coarsely chop fresh fruit, or drain canned fruit. 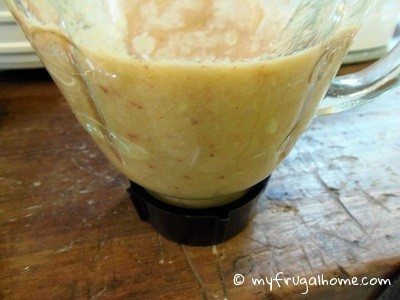 Puree your fruit in the blender. It takes three cups of puree to make a batch of fruit leather. If you don’t have enough, puree more fruit, or top off your puree with applesauce. Spread the puree out on your cookie sheet, so that you have an even layer. Place it in the oven, and set it to the lowest temperature. 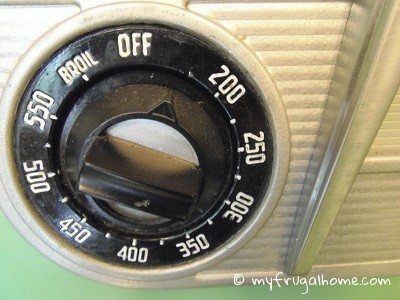 If your oven has a warming setting, use that. You’re goal is to dry the fruit out — not cook it. 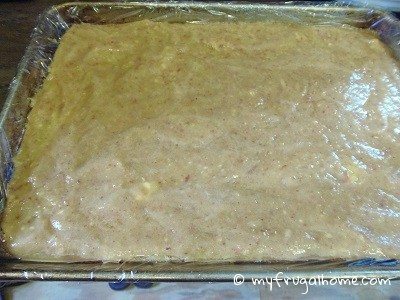 It’ll take 8-12 hours to dry out your fruit leather in the oven. You’ll know it’s done, when it feels dry to the touch. 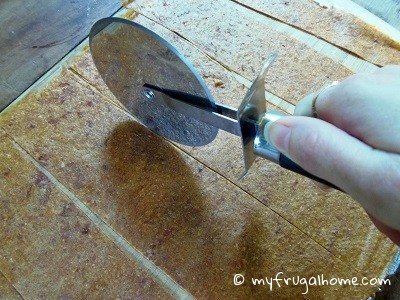 Peel your fruit leather off of the plastic wrap (or silicone baking mat), and cut it into strips with a pizza cutter or scissors. 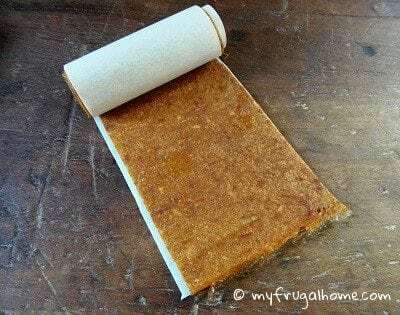 Roll your finished fruit leather up in parchment, and store it in an air-tight container. It’ll keep for many weeks. This recipe is sized for a 13×18″ cookie sheet. If you’re using a larger or smaller cookie sheet, adjust the amount of puree accordingly. You want a 1/8-inch layer of fruit puree covering the entire cookie sheet. One can of fruit yields around two cups of puree. Add a teaspoon of lemon juice to light-colored fruit purees, to prevent browning. Skip all the chopping and pureeing by making fruit leather out of applesauce. If you need to run out before your fruit leather is done, just turn the oven off, and turn it back on when you get back. Hi there I love! your site!!! Thanks so much for this. You are saving me a ton! I swear I was thinking this morning that I’d love to get a chicken, but it gets cold in the winter here. Low and behold, your site had the answer! I have a question about this recipe. You mention applesauce. Does this work for store-bought blended flavor applesauces, i.e. raspberry, cinnamon apple, blackberry, etc? Thanks again! Hi Rai, glad to hear you’re finding tips you can use 🙂 Chickens are a lot of fun, and the novelty of free eggs just doesn’t wear off. To answer your question: store-bought flavored applesauce would work beautifully for this. 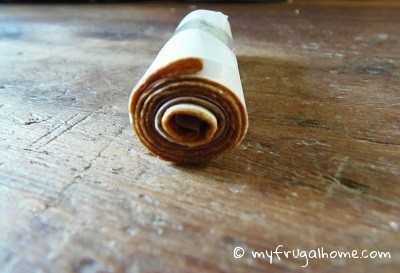 I’ve made fruit leather from applesauce several times, and it’s always been a hit with my kids. Hi I have tried the fruit leather in a dehydrator for the first time with limited success. I am wondering if I can line a cookie sheet with parchment rather than plastic wrap to dehydrate in the oven? Hi Danielle, I think parchment paper would probably stick to the fruit leather and be hard to remove. If you don’t want to use plastic wrap, a Silpat would be another option. Thanks for the information. I will try the Saran Wrap. My aunt suggested using the plastic wrap in the dehydrator on the trays as well. That will prove to be more difficult as the trays are round and have a hole in the middle. If you have any tips on covering them, I would appreciate your knowledge and experience. They make fruit leather trays for dehydrators that fit on top of the regular trays. If you haven’t tried those yet, that may be the way to go. I have a set, and they work really well. They aren’t expensive either; you can get a set of two for around $7. Hi Erin, love your site. Does it call for any water with the fruit in the blender? I try to blend the fresh apple without liquid and it did not blend. Other recipes call for cooking the fruit first. I am confused. Thank you and hope to hear from you soon. Good question. It sounds like I need to go back and add a bit more information to that post. If you’re using something like strawberries or peaches, you can just blend them. There’s enough water in those fruits that you won’t have to add any. If you want to make apple fruit leather, you’ll want to start with applesauce. You can either make your own applesauce, by cooking down apples, or you can buy a jar of applesauce, if you prefer. Since applesauce is already the perfect consistency for fruit leather, there’s no need to blend it first.